How to follow: Watch live on BBC One from 19:00, listen on BBC Radio 5 live and BBC local radio; text commentary on the BBC Sport website. Manchester United's FA Cup quarter-final replay with West Ham on Wednesday is the "defining moment" of their season, says defender Phil Jones. Last month, manager Louis van Gaal said United were competing on three fronts. They have since lost to Liverpool in the Europa League and are four points behind Manchester City in the race to finish fourth in the Premier League. "We have to go to West Ham, play well and beat them," said Jones, 24. "It has been a difficult season." United's campaign took another downturn on Sunday when they conceded three times in six minutes to lose 3-0 at Tottenham. "The players are gutted with the result and the way we conceded so quickly," added the England international. Failure to win the FA Cup would mean the Old Trafford club have gone three seasons without a major trophy for the first time since 1987-89, the early years of Sir Alex Ferguson's reign. Jones was part of the squad that won the Premier League in 2012-13, the Scot's final season in charge. Since then, United have struggled to adapt to life without Ferguson in the dugout, reaching one League Cup semi-final under his successor David Moyes and finishing no higher than fourth in the league. "There is a big incentive to get our hands on some silverware," said Jones, who signed from Blackburn in 2011 in a deal thought to be worth up to £17m. "There is no-one more disappointed than the dressing room. We know we have to excite the fans, play attractive football and win games. "I don't think we can look at anyone in the dressing room and say, 'you didn't give 100%'. Everyone gives their absolute maximum for this club, the fans and the manager. At times it has not worked but we are still positive." Jones completed the full 90 minutes of Monday's 1-0 under-21 win against Middlesbrough at Old Trafford. It was only his second game since 2 January after it was found he had strained ankle ligaments in a game at Watford six weeks earlier. "I just landed awkwardly," said Jones. "I thought it was nothing at the time but one thing leads to another and then you're out." It was the latest fitness issue for the player capped 20 times by his country. He has started just seven games this season, fewer than team-mate Luke Shaw, who broke his leg in September. 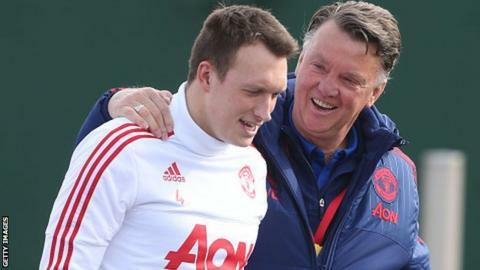 Jones missed the start of this campaign with mild thrombosis, played only one game in three months from September 2014 with a combination of hamstring and shin problems - and had two month-long absences the season before that too. He has started 104 Premier League games in his five seasons at Old Trafford and has never started more than 30 league games in one campaign. "It has been difficult but there is no point dwelling on the past," he said. "You can't change what has been done - I am just looking ahead. "I still think I need more fitness, but if the gaffer feels I'm ready for the West Ham game I am happy to be part of it." Jones has been picked for every England squad he has been fit for since he was first called up in September 2011, just after arriving at Old Trafford. He has little time to prove he is worth a place in Roy Hodgson's 23-man squad for this summer's European Championships in France, which the England boss will name on 12 May. "Roy has regular contact with all the players," said Jones. "He has not spoken to me personally, but the doctors will talk, ask how you are and report back. "It's not in the forefront of my mind, though. Obviously I'd be absolutely delighted to be there but I have got to get back playing first, that's the main thing."